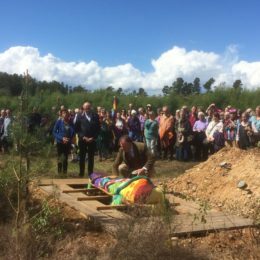 The Wilkies Wood Green Burial site is proving to be an important community resource with Adriana Bijman’s burial on the 14th of May 2017 being the 24th to take place, a further forty-nine lairs having been pre-sold and with space for several hundreds more. Planning permission for the site was granted nine years ago, which is when the Findhorn Hinterland Group established this enterprise with monies being used for the conservation of the whole area now managed by the Findhorn Hinterland Trust. There has been no security with the land owners to ensure this good work carries on but this is about to change as the FHT takes on becoming the official burial authority, something required by Scottish law following a new act passed last year, and to this end it is in the process of purchasing the site for a nominal fee from the Findhorn Foundation, the current owners. This is an important step for the trust as it secures this income for its work in the future but also means that it takes on significant responsibility to manage the site for now and one hundred years after the last burial! Now that is really having to think about and plan for the future! To find out more about the site click here or about how to reserve a lair here. This entry was posted in News and tagged Green Burial.